Do the consoles have the raw horsepower to meet DICE's ambition? 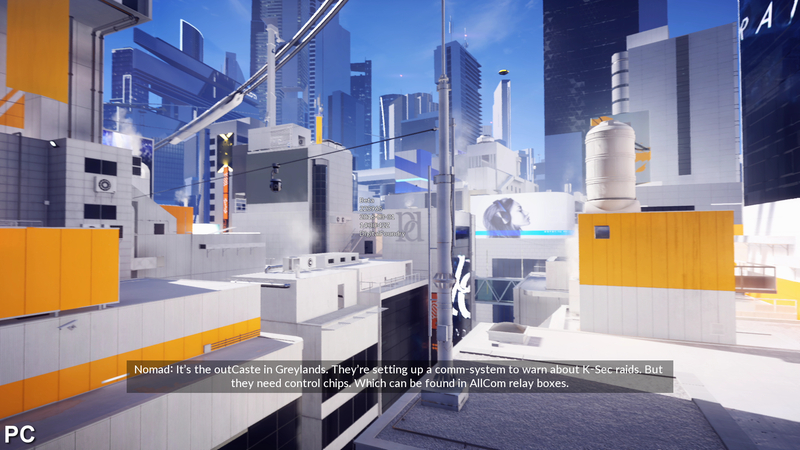 Serving as both a prequel and a reboot of sorts, Mirror's Edge Catalyst swaps out the last-gen title's Unreal Engine 3 for DICE's proprietary Frostbite 3, with the developer targeting 60fps for this latest outing - a sizeable jump from the 30fps original. The recent beta gave us our first in-depth look at the game and the changes brought by the switch to a newer engine, which delivers a very different visual experience on screen from the original game. It's an ambitious effort, but even with a final round of optimisation to go, the question is - can the current-gen consoles deliver DICE's vision? 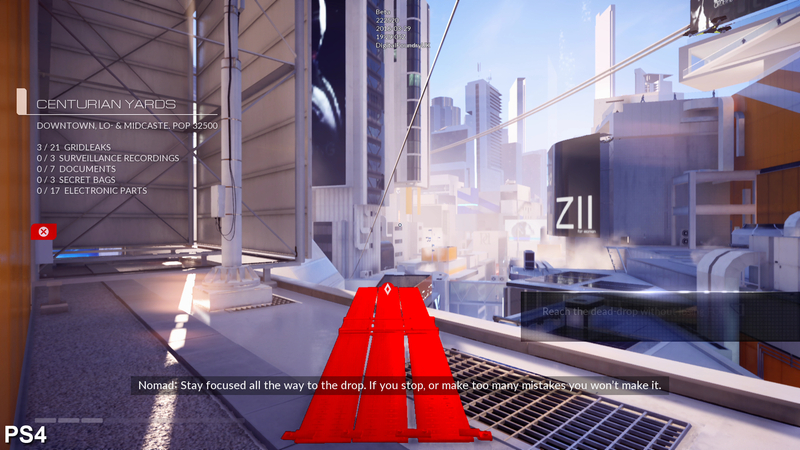 The city of glass is a perfect fit for the physically-based rendering model in Frostbite 3, with elements such as glass, steel, and marble appearing natural, while the use of Geometrics' Enlighten global illumination solution allows for reflected light across virtually every surface, infusing the game with a high contrast look that stands out from the crowd. 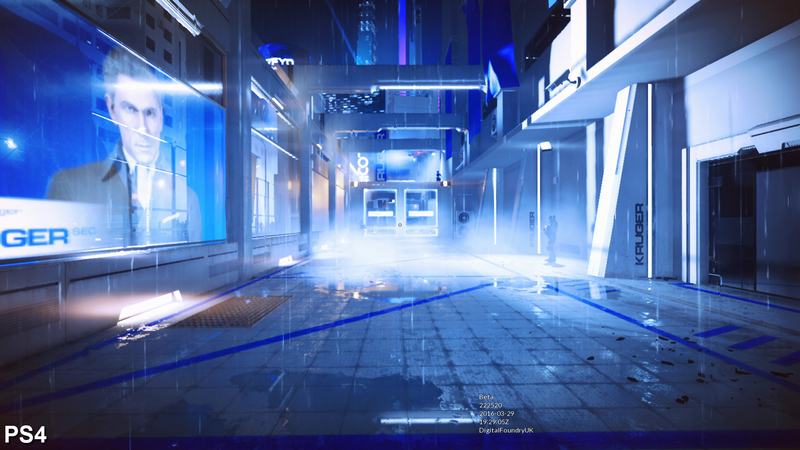 Frostbite 3 is a known quantity at this point, and DICE has taken to focusing on increasing effects work and general graphical quality instead of pushing for a resolution boost. As such, bearing in mind the 60fps target, it's no surprise to discover that the PS4 version renders at 900p while the Xbox One framebuffer is knocked down to 720p. It's a familiar set up to Star Wars Battlefront, with all the same pros and cons. On the plus side, sub-native rendering allows the developer to target 60fps more easily, but as a result image quality takes a hit - particularly on Xbox One where upscaling artefacts are easy to spot across geometry edges. 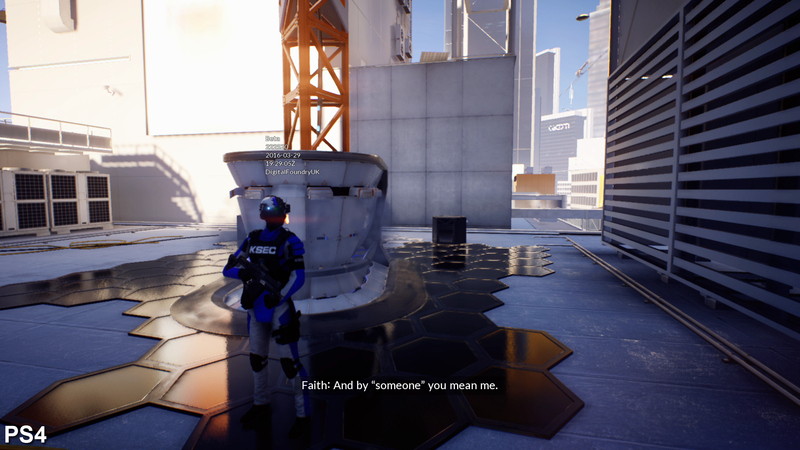 The PS4 version holds up more favourably to the PC game: the presentation is noticeably softer, but fine details and edges aren't unduly compromised to the same degree as Xbox One. That said, it's the PC release that offers up the most refinement here, with resolutions at 1080p and beyond delivering better clarity and sharpness across the scene, backed up by additional visual features. Of course focusing GPU resources away from raw pixel counts on consoles allows the game to shine in other areas. Materials appear realistic, and lighting confidently saturates the scene, bringing visual flare and depth to the environment. It's a massive step up from the more clinical look of the UE3 powered original with plenty of current generation polish. However, this new artistic approach has some downsides in terms of gameplay. The saturated high constant aesthetic makes it slightly harder to identify objects gently glowing in red, which act as a natural waypoint through the environment. 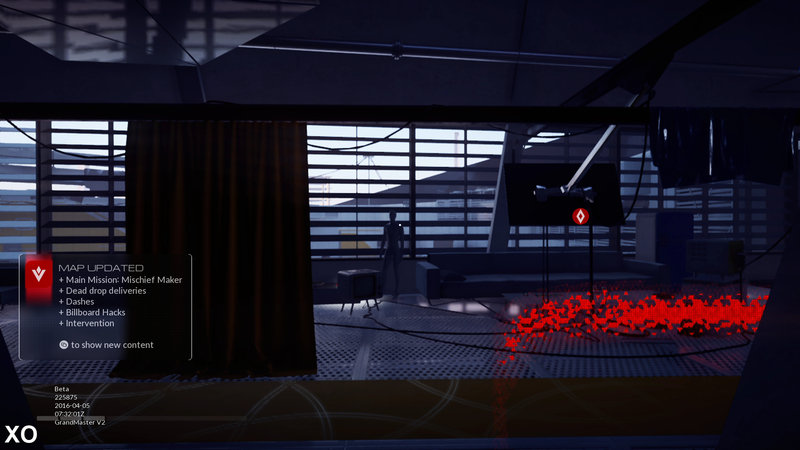 To get around this, a floating red burst of energy is also used to help show players the way to the next mission point, though this also feels like unnecessary handholding at times. 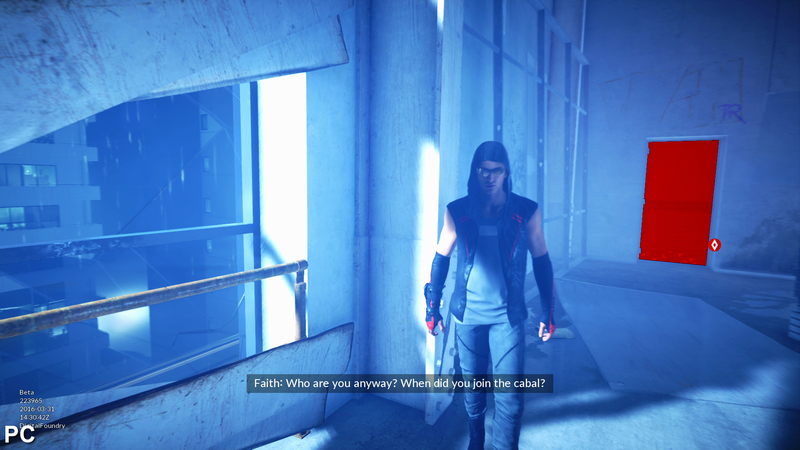 Die-hard fans may not like the change, but it makes sense as Catalyst is set in an open world where the player can carve out multiple routes to their destination. 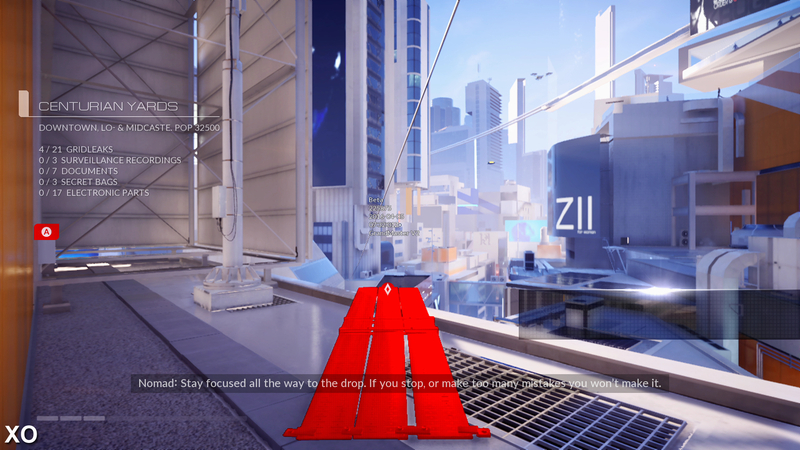 On the plus side, the open world environment is continuously streamed in too, eliminating loading times when traversing from one location to the next. This helps to keep gameplay flowing, but isn't without a few side effects in the current build. 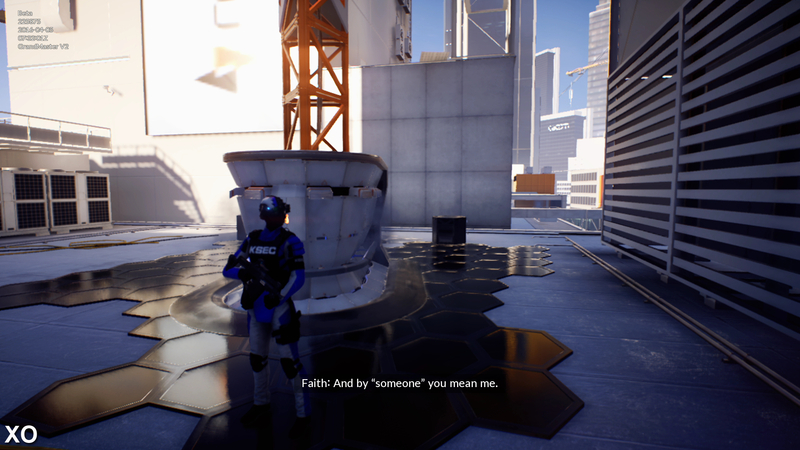 For example, the GI lighting sometimes fails to load in before a player takes control, plunging the immediate area into a veil of darkness, while texture and shadow pop-in are commonplace. 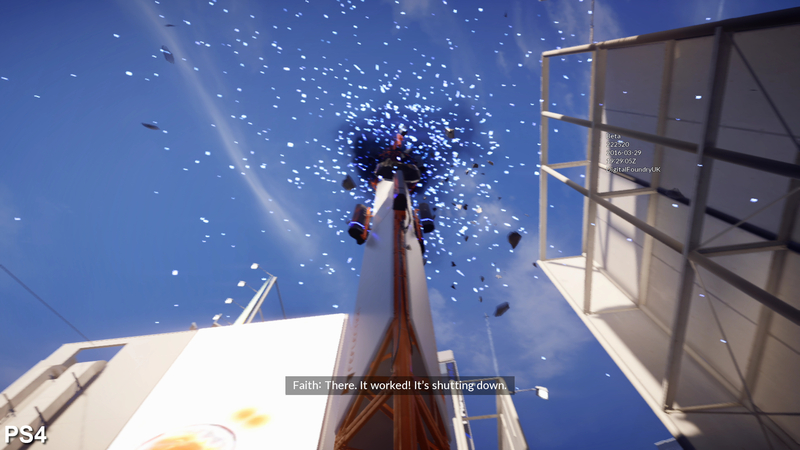 It's also worth noting that loading still takes place when respawning at checkpoints, so gameplay isn't quite seamless when something goes wrong. 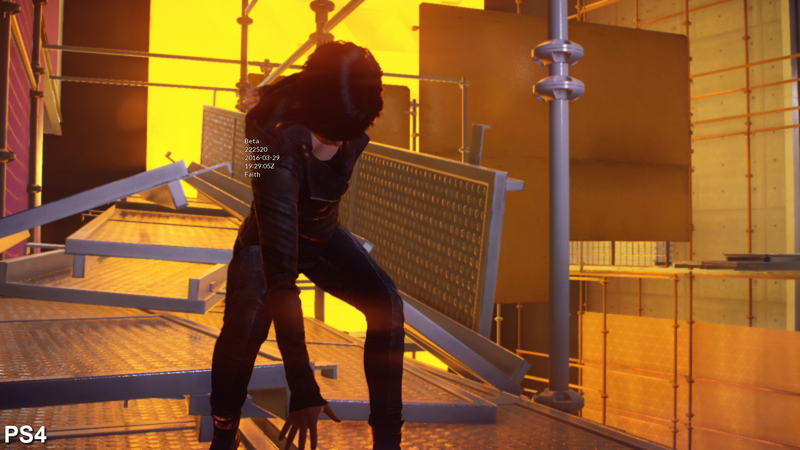 Other bugs also cropped up during our time with the beta, such as characters occasionally clipping through scenery during the real-time cut-scenes, and the Xbox One version freezing up for a few seconds at point. A 900p resolution is present on PS4, which looks a little soft up against the PC version running at 1080p, though it holds up pretty well overall. 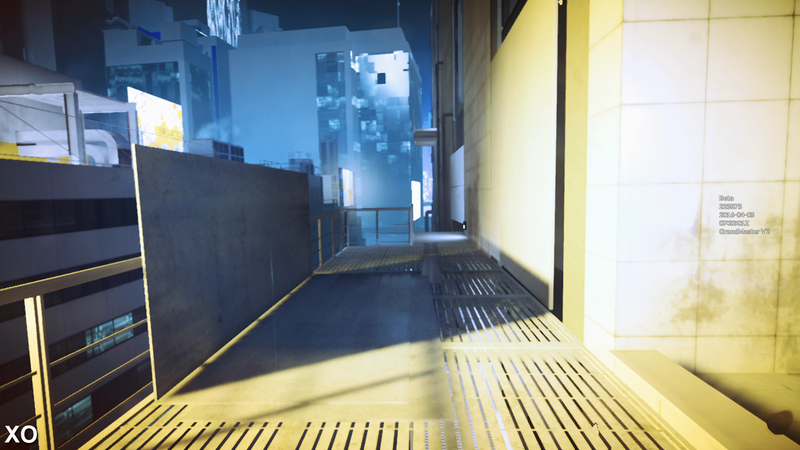 Meanwhile, the 720p image on Xbox One appears rougher in comparison. PC takes the lead with shadow quality: cleaner and better defined. 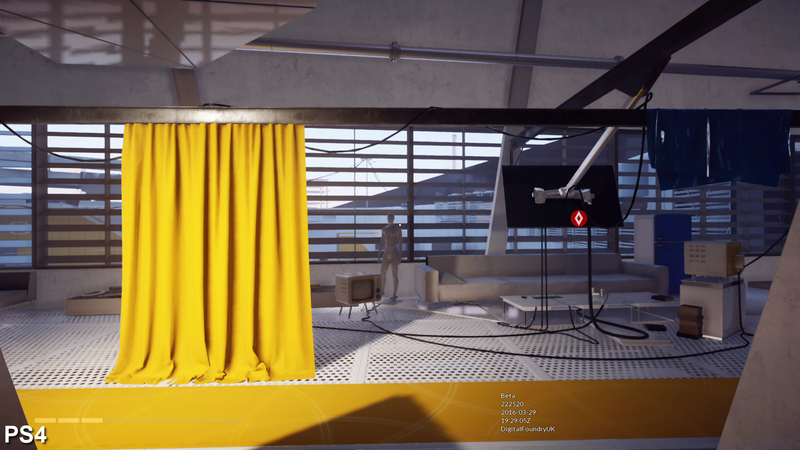 Shadows on PS4 and Xbox One feature more edge artefacts and look visibly softer. The PC game isn't immune to throwing up low resolution shadow artefacts. Saw-tooth edges are clearly present across all platforms on the floor by the window. LOD transitions are most aggressive on Xbox One, where buildings are culled at fairly close range. 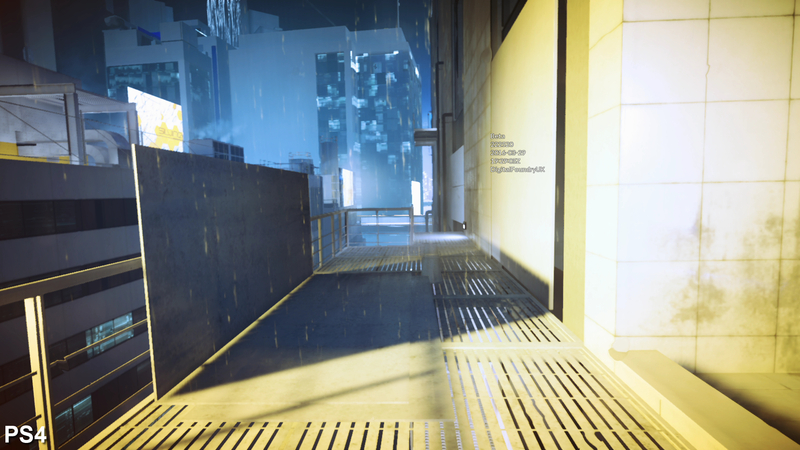 On PS4, it's mainly texture detail that takes a hit compared to the maxed-out PC experience. Higher resolution textures are used on PC, lending extra clarity to fine details such as the gravel on this rooftop. Horizon-based ambient occlusion on PC provides more refined indirect shadowing. Notice how the vents on the right feature thick halos on PS4 and Xbox One, whereas these artefacts are less pronounced across the scene on PC. Visually, both consoles share the same core artwork, and the majority of effects are also a match. 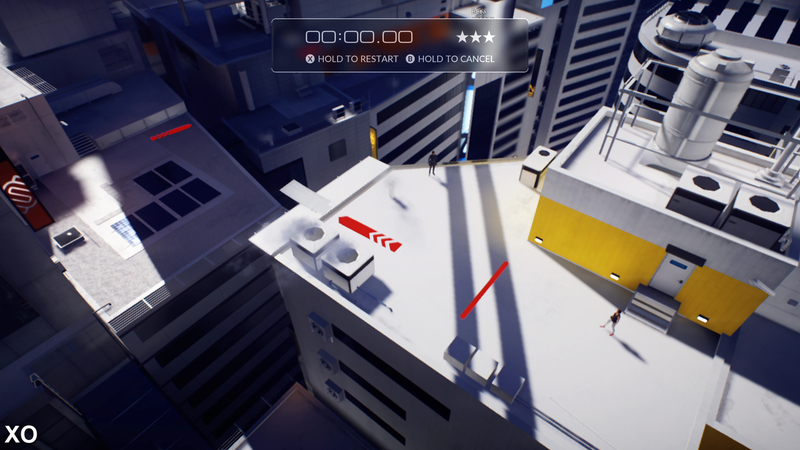 However, the PS4 game commands an advantage in a few areas, giving this version a slightly more polished feel. 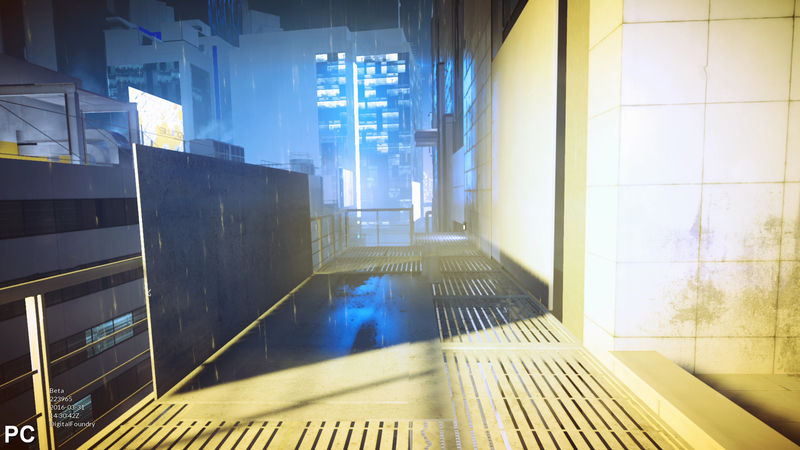 Rain is pared back in some scenes on Xbox One, while environment streaming is more aggressive, with large buildings culled from a closer distance than the other platforms. 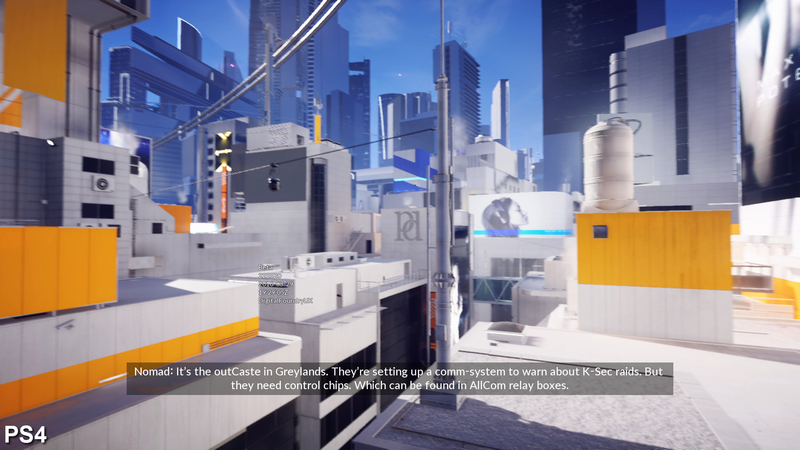 On PlayStation 4, large structures are rarely omitted during LOD transitions, with models switching quality levels. As expected, PC takes point in a number of areas. 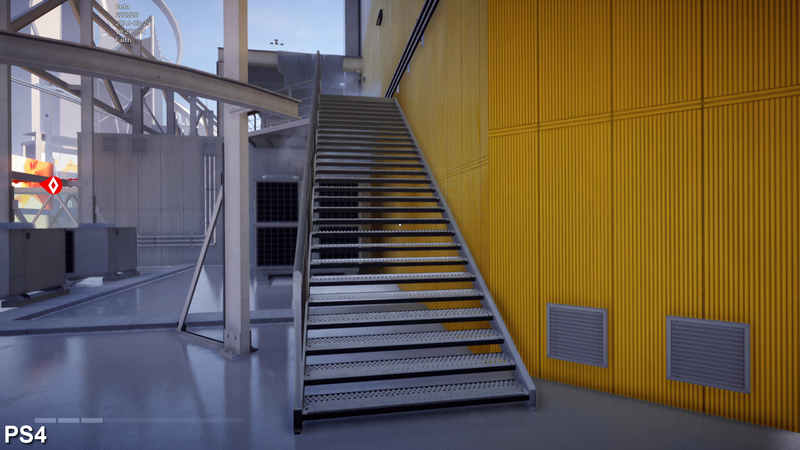 Higher resolution textures and normal maps allow for fine details to be displayed with greater clarity and definition, while shadows also appear sharper and more defined, with less stair-stepping across edges. Particles are also rendered at a higher resolution, while environment reflections are more consistently deployed across wet surfaces. 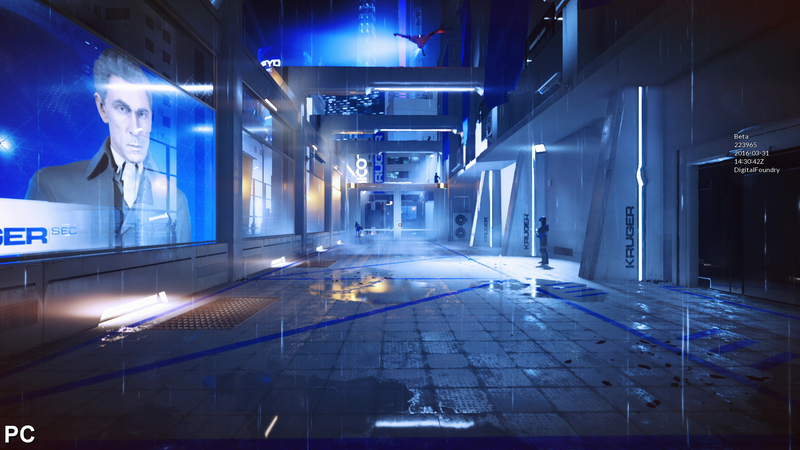 On console, reflections across puddles of water are absent in some scenes, but not all. Texture quality is a mixed bag. 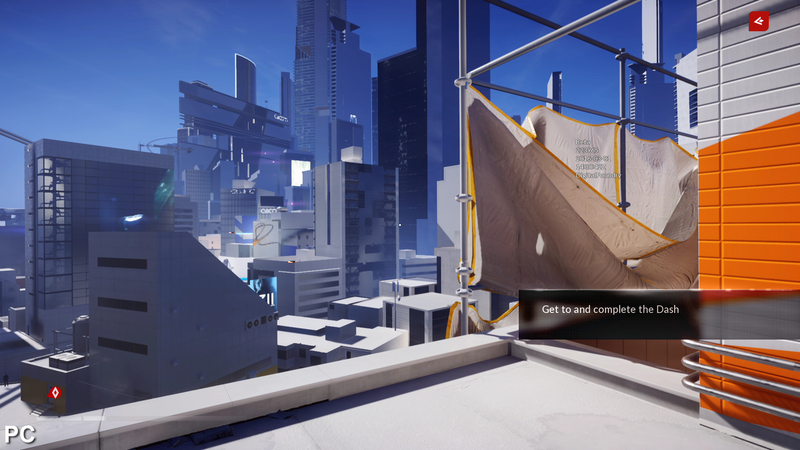 Gravel and stonework on rooftop gardens appear suitably detailed on all formats, but the artwork used for the electronic billboards isn't up to the same standard, with consoles in particular getting some very low resolution textures here. The beta weighs in at just over 10GB, so it's a possibility that we're not seeing the highest quality assets used across all surfaces. LOD transitions are also visible, with shadows, textures and geometry popping into view as the engine switches between quality levels. Here assets load in more quickly on PC, helping to reduce the jarring snap between assets - but it's not always a seamless process. 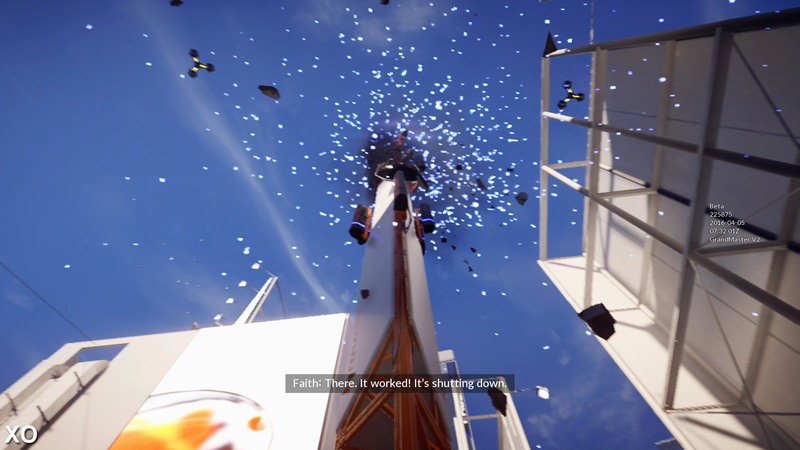 Particle effects are deployed at slightly lower resolutions on consoles. Notice how these elements appear sharper on PC. 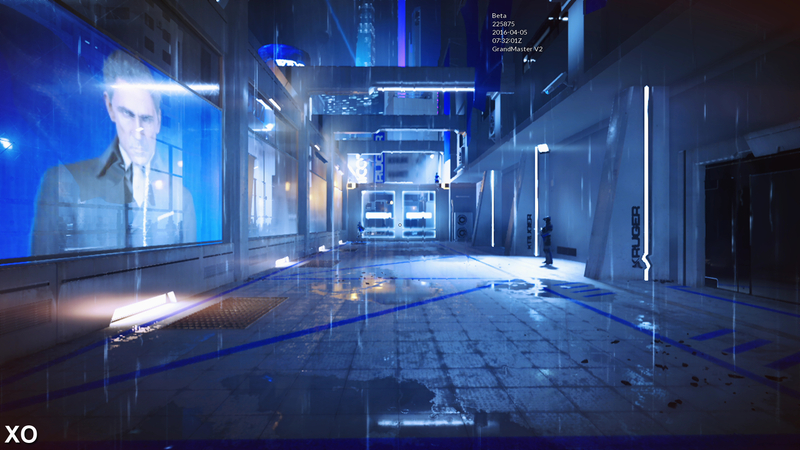 In this scene, the amount of rain is reduced on Xbox One, while environmental reflections are present across wet surfaces on the ground in the PC build. Effects work is much closer in this scene, suggesting beta-related rendering bugs may account for missing effects in other areas. 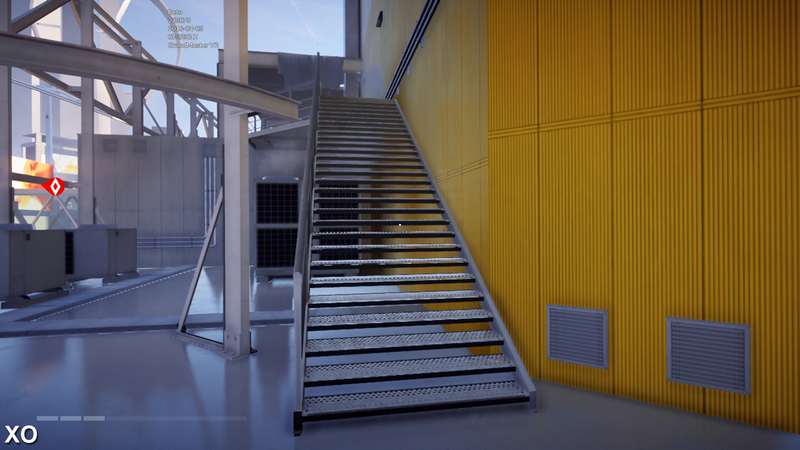 16x anisotropic filtering on PC allows textures to appear clearer from oblique angles. However, the game's high contrast, minimalistic art style often makes it hard to see a difference. Some bugs are expected with unfinished code. 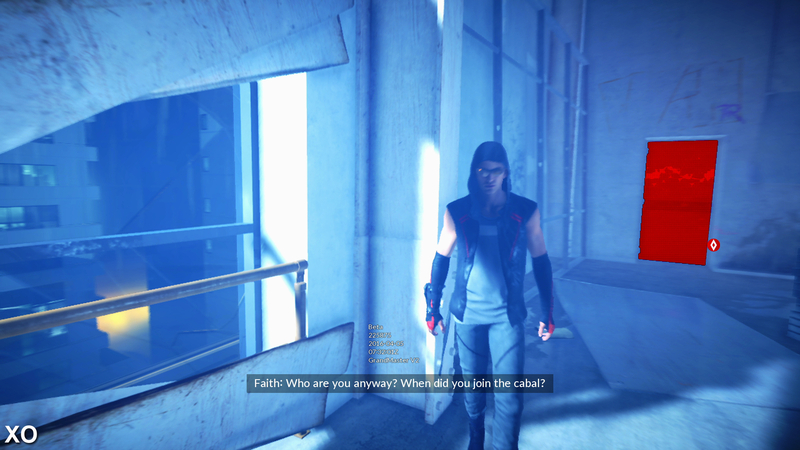 In this scene the global illumination lighting loads up late on Xbox One and PC, which makes the environment appear much darker in this snapshot. Another bug. 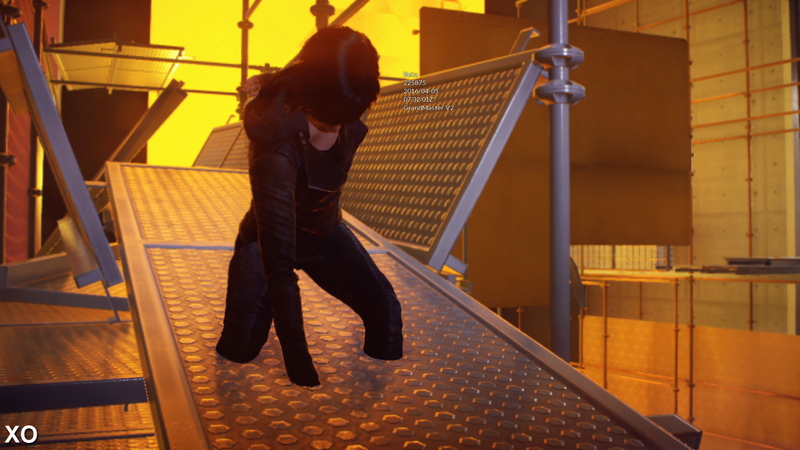 Here, Faith clips right thrown the metal floor panels on Xbox One, which have landed in an unusual position. 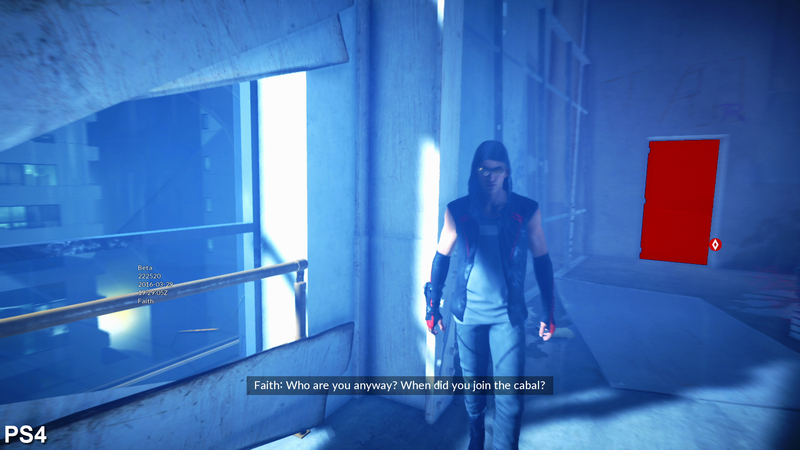 Clearly, targeting 60fps has immediate benefits for the gameplay in Faith's latest outing. Motion is a lot smoother than the 30fps original, while controls feel considerably more responsive due to the reduction in latency. Traversing rooftops and taking down enemies feels a little more effortless in this respect, although the use of triggers and shoulder buttons to perform all key actions takes time to get used to. Those well-versed in the series' gameplay quirks should have no problems here, where the improved frame-rate is obviously beneficial. Unfortunately, performance isn't as solid as we'd like, and frame-rates frequently fluctuate on a regular basis across both consoles. At worst, a lunge down to near 30fps rears its head in one particular scene, but metrics mostly stick between 50-60fps over a run of play. This causes judder that distracts during high speed traversal, with momentary spikes on controller latency having an impact on pulling off more complex moves. 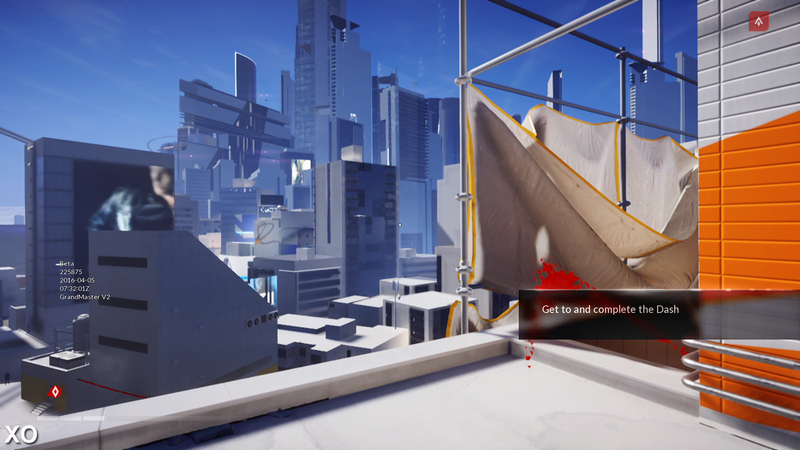 The PS4 version gets closest to providing a 60fps lock for extended durations, while on Xbox One the engine struggles to hit the desired frame-rate once you start exploring the rooftops or engaging in combat. The 'perceptual' 60fps experience is certainly within reach, and there are times when both platforms operate smoothly with no issues. Less demanding scenes with little action see performance stabilise, with consistent gameplay during these moments. Our main concern with performance on both consoles is with the heavy spikes in frame-times, which reach upwards of 80ms at various points. This causes noticeable stutter as the game essentially freezes for a few frames, which is rather distracting. This only happens when quickly traversing the environment, suggesting that background streaming is the cause here. This can be a CPU-intensive process, and it's likely that this is responsible for the engine stalling. 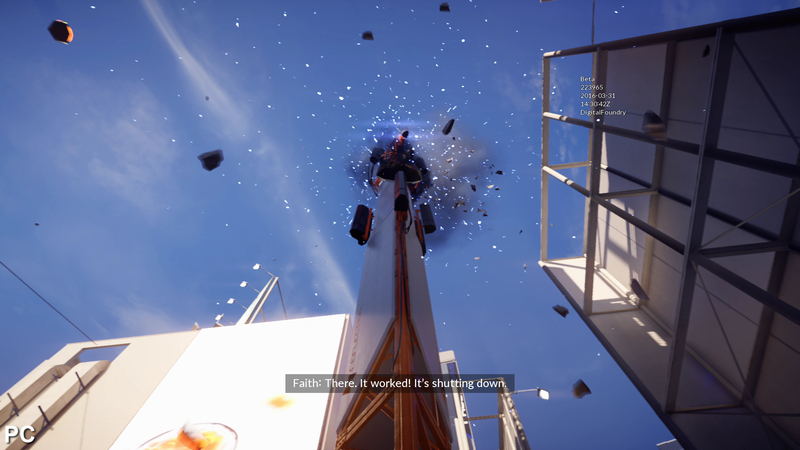 This often makes the frame-rate drops feel worse than they actually are, which is a shame as the engine is clearly capable of hitting 60fps, and when performance is only slightly impacted the effect on gameplay is fairly minimal. 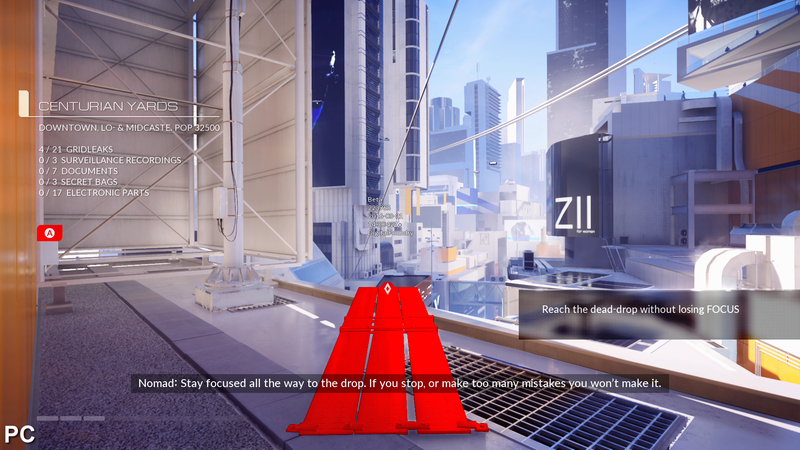 Mirrors Edge Catalyst aims for 60fps on both consoles, though neither manages to hold to that target for extended periods of time. The PS4 comes closest, but stutter and variances in frame-times are an issue at times . Cut-scene playback could also be better. 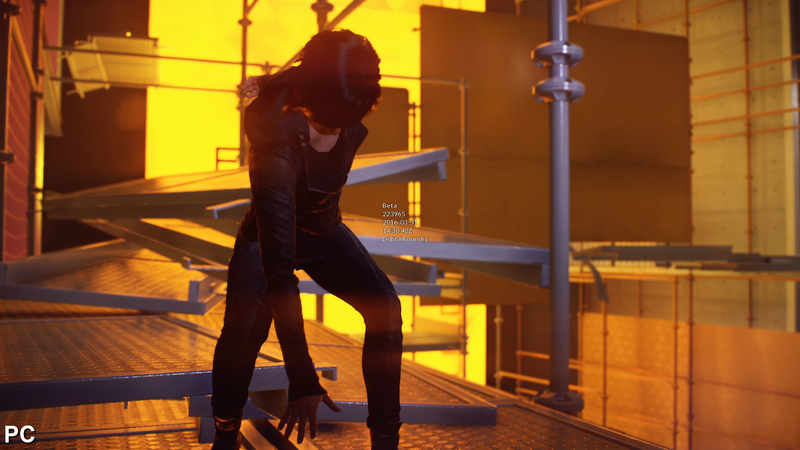 These consist of video sequences derived from enhanced in-engine renders, with characters featuring more detail and better shader effects than the in-game models. 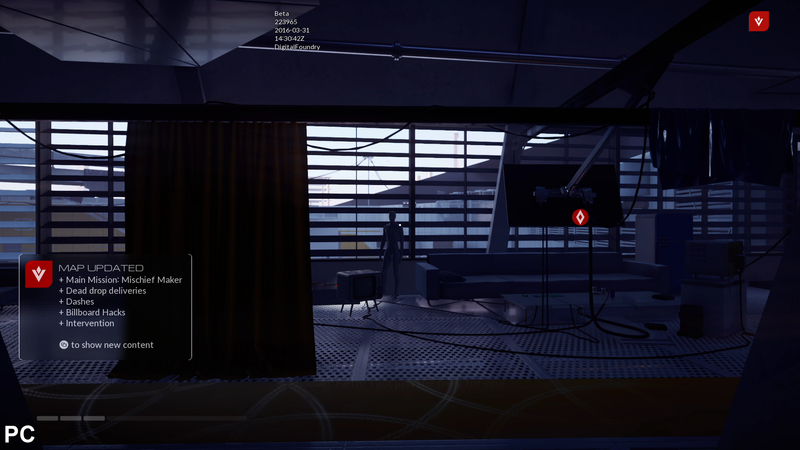 Frame-rate here is capped at 30fps, but surprisingly performance isn't stable, and frequently the engine struggles to stream these sequences from the hard drive with dropping frames. Of course, it's worth stressing that the game is still in beta, and what we're seeing here isn't fully representative of final code. Do you really know the rules? 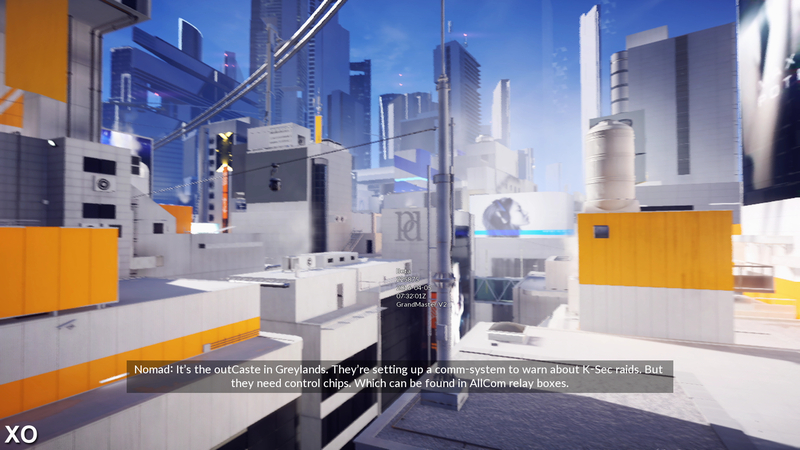 Overall, there's a sense that DICE has really pushed the boat out with Mirror's Edge Catalyst, but perhaps the level of ambition from the developer outstrips the console's capabilities - already pushed to the limit, as evidenced by the sub-native rendering resolutions. 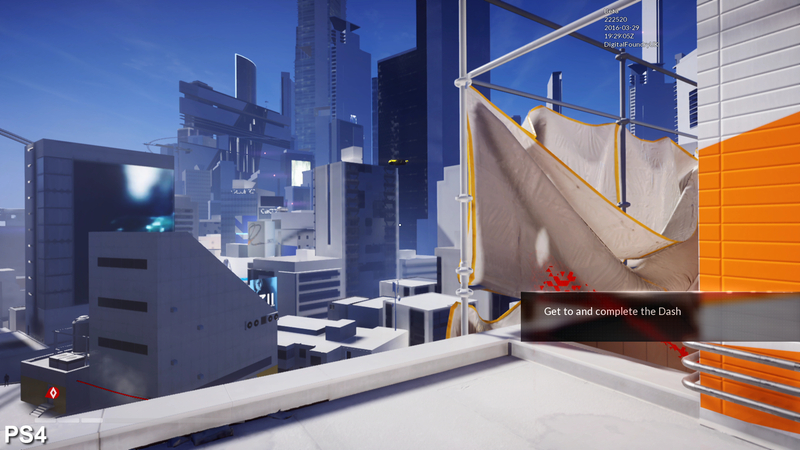 The developer targets 60fps but doesn't quite hit the target, but it's the intrusive stutter that has the biggest impact on the quality of the experience - and it takes PC power to push beyond those limitations. 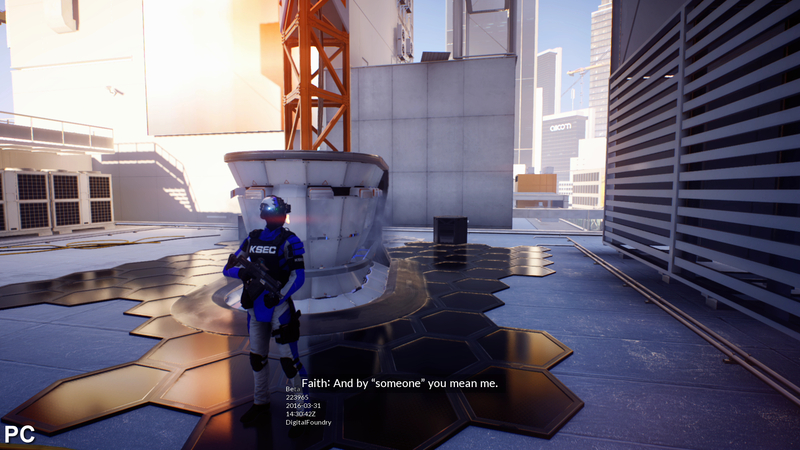 Of course, there's still time for DICE to polish up performance and fix any bugs before the final release - and it may well be that the final code does a much better job of hitting the frame-rate target and ironing out the stutter. DICE has good form here too: the massive improvement in performance between the E3 and beta versions of Star Wars Battlefront was remarkable, while the code improved still further between beta and release. Here's hoping for a similar result for Mirror's Edge. Walkthroughs to each main mission and their hidden collectibles detailed. Learn how to unlock fast travel to safe houses by completing each area's Gridnode. Digital FoundryGTX 1660 Ti vs GTX 1070: Which is best for 1080p and 1440p gaming? Nvidia's new RTX-shy GPU tested against its closest competitor.